There have been improved interventions of various faith based collectives, across India, in combating homophobia and advancing queer readings of Theology since the past decade. 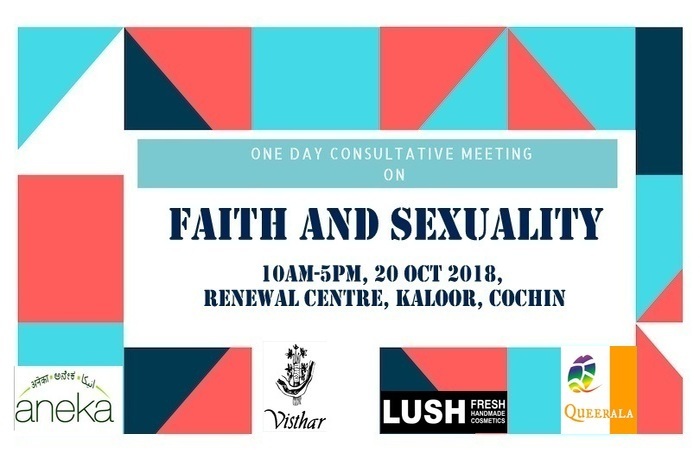 However the socialisation of LGBTIQ people, as themselves, among faith groups has not gained appreciable levels.
. As a prelusive attempt, we call for a One Day Consultative Meeting, in this essential area of social inclusion in presence of queer community persons and representatives from faith groups/organisations. The gathering shall primarily address the responses from community individuals while delving into possible practical options of coalitions with faith groups for advocacy in areas of radical inclusivity of LGBTIQ among the faith groups, law, healthcare services and education. How faith congregations can ponder on the civil rights aspects of queer population will also be discussed, thereby, to construe social involvement of the groups in area of LGBTIQ Human Rights. This program, with schedule as given below, is combinedly organised by ANEKA and QUEERALA and hopes to create platform for discussion on better forms of inclusive enclaves. consultative meeting, faith and sexuality, queer.